Many parents hate to see their children skip breakfast before sending them off in the morning. Reason tells them that in order to maximize learning in school, children's bodies need plenty of fuel. A recent study indicates that parents' intuition may be correct: Well-fed children make more progress in school than children who leave home with their stomachs empty. 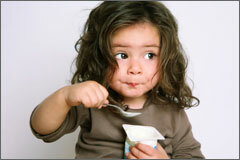 Children are more vulnerable than adults to missing a meal. The brain of a child is not just a scaled down version of an adult brain. It is larger in proportion to his or her body. Though the brain makes up only one-fiftieth of a child's body mass, it uses about half of the body's stores of energy. It is also changing rapidly: Nerve cells are growing and cell connections are adjusting rapidly in response to the environment. All of this increases the brain's demand for energy.